Imagine your finished dream remodel, complete with stone countertops custom-made by craftsmen right in-house. Instead of waiting for a special order to arrive, the company delivers a product to your door built with such quality craftsmanship, making your kitchen an eye-catching showpiece for years to come. You know it’s unlikely any other house in the city will have it. Stone Artisans, custom fabricator and installer of natural stone products, can work that magic for you and more. The company started doing business almost 10 years ago, but their staff of professionals have decades of experience between them in the stone, construction and customer service industries. 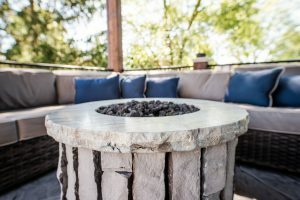 Stone Artisans can do any project for your home using the best quality stone, granite, quartz, marble, soapstone and even metal to create a unique piece for your space that’s tailor made to fit your personality. “Each successful project is a perfect blend of carefully integrating the customer’s vision with the designer’s creativity and expertise,” says President and CEO Cory Kroger. It all starts with an expert from Stone Artisans who will create that personality by selecting from hundreds of colors and patterns, giving you endless possibilities and creativity in designing your project. They’ve created exclusive projects like a kitchen island wrapped in stone, furniture like a coffee table and end table, even a custom waterfall feature and fire pit piece. But whether your project is a grand outdoor kitchen or a standard bathroom remodel, Stone Artisans will work with you, helping you find the best choices for your budget and space. Their goal is to make the process simple and cost effective for you. Custom creative projects are certainly what sets Stone Artisans apart from the rest, but customer service is a part of that too. Their special touch reflects in the way countless customers have written in to the company praising them for their prompt and professional service, not to mention the high quality of their products. Stone Artisans serves residential and commercial customers and does remodels or new builds. Contact them today at 317-874-8955 for a free estimate. Visit them online at stone-artisans.com to see some of the extraordinary projects they’ve done and find out how they can make your project amazing.